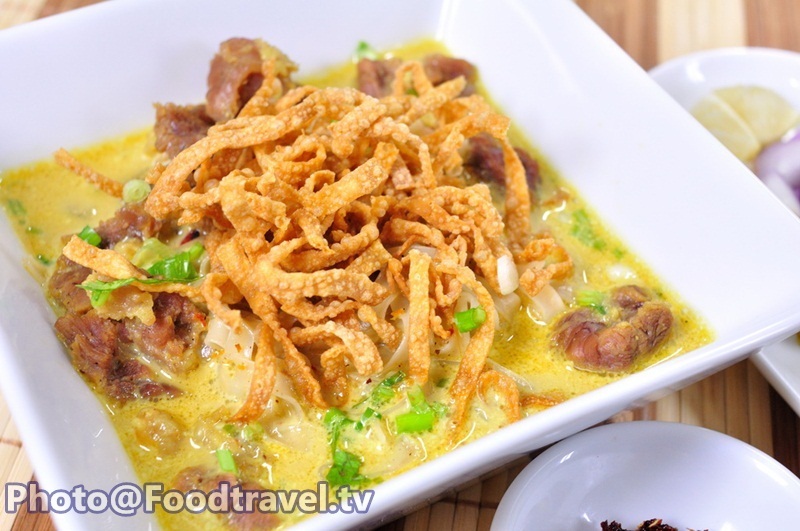 Egg Noodle in Curry With Beef (Khao Soi Nuea) - Another delicious and popular North recipe. We guarantee that it will be your favorite dish for many of you. Today we make like the original recipe. 3. Soy sauce 2 Tbsp. 6. Coconut milk 2 cups undiluted coconut milk +4 cup dilute coconut milk 500 kg. 9. Ginger chopped-roasted 1 Tbsp. 10. Large Dried Chilli Remove seeds - cut into small piece - roasted 2 tablets. 12. Coriander seeds roasted 2 Tsp. 14. Turmeric chopped- roasted 1 Tbsp. 1. Roast Cha-ko, coriander seeds, ginger, dried chilli, onion and turmeric. Pound all ingredients well together. 2. Pour dilute coconut milk into a pot and heat to boiling, always stirring. When boiling, put salt, beef and wait to boiling. Low the heat and simmer until soft. Spoon 1/4 cup of coconut milk on top. Heat the pan on the stove, add pounded ingredients and fry. Then pour in meat pot, add undiluted coconut milk. Season with soy sauce, black soy sauce or put salt in it. 3. Blanch 4 blocks noodles in boiling water until soft. Then put in cold water and bring up to drain dry. And fry 1 another block in oil until golden and crispy about 3-5 seconds. Drain oil and let it cool, then cover to make it crispy. 4. Arrange the dish and serve with soup.